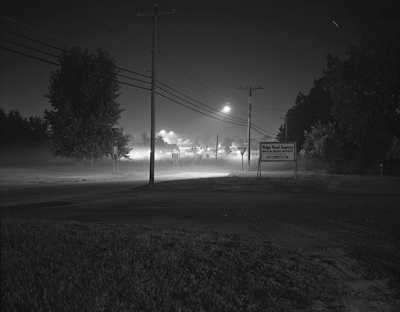 Stephen Tourlentes received his BFA from Knox College and an MFA from the Massachusetts College of Art in Boston, where he is currently a visiting professor of photography. His work is included in many collections including the Princeton University Art Museum, The Metropolitan Museum of Art and The Art Institute of Chicago. He has exhibited at the Revolution Gallery, Michigan; Cranbook Art Museum, Michigan; and S.F. Camerawork, among others. 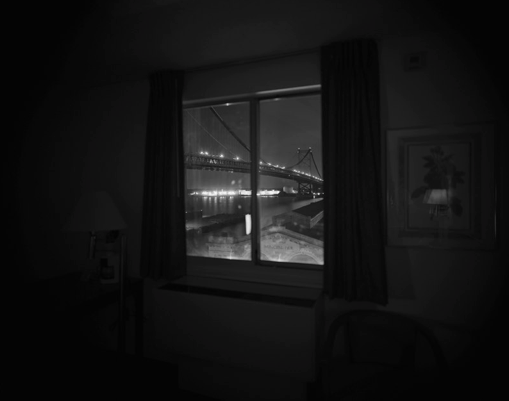 Tourlentes has received a John Simon Guggenheim Foundation Fellowship, a Polaroid Corporation Grant, Massachusetts Cultural Council Grants, MacDowell Colony Fellowships, and was a finalist for the ICA Boston’s Foster Prize for 2010. His work is included in the forthcoming exhibition "Night Vision" that will open at the Metropolitan Museum in New York on April 26th, 2011. 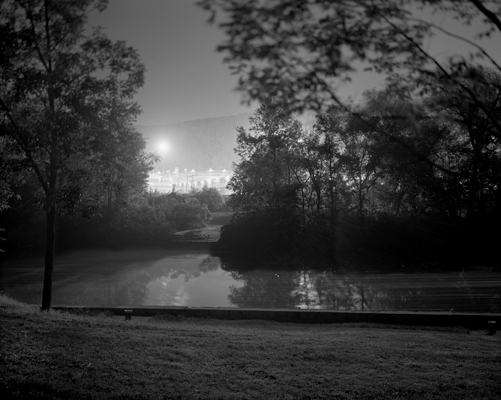 Since 1996, Tourlentes has photographed penitentiaries glowing with security lights at night in the context of their surrounding landscape in his series Of Lengths and Measures: Prison and the American Landscape. A large portfolio of this work can be enjoyed on his website here. Two excellent existing online interviews explore Tourlentes' background and work. There’s a 2008 interview with Jess T. Dugan on Big RED & Shiny here and a second with Pete Brook on Prison Photography published in 2009 here. Both have granted fototazo republishing permission. Tourlentes has answered new questions for fototazo designed to complement these two previous interviews and this article draws from all three sources, sequences and combines them, to form an extensive look into Tourlentes' work. Jess T. Dugan: What is your background in the arts, and how did you come to photography? Stephen Tourlentes: My parents were very involved in the arts while I was growing up. My father always took pictures and set up a small darkroom in our house when I was a teenager. I studied art while an undergraduate at Knox College in Galesburg, Illinois. After graduation I moved to Boston with some friends and played in a band for several years. Clearly the music career was not happening, so I enrolled in the MFA program at Massachusetts College of Art. 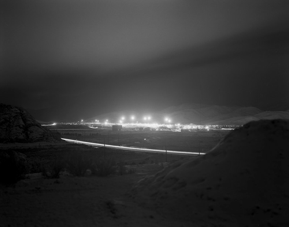 JTD: How did you begin to photograph prisons? ST: The State of Illinois built a new medium security prison in my hometown in the late 1980's to replace a large state mental hospital that my father had been superintendent of during the 1960's. 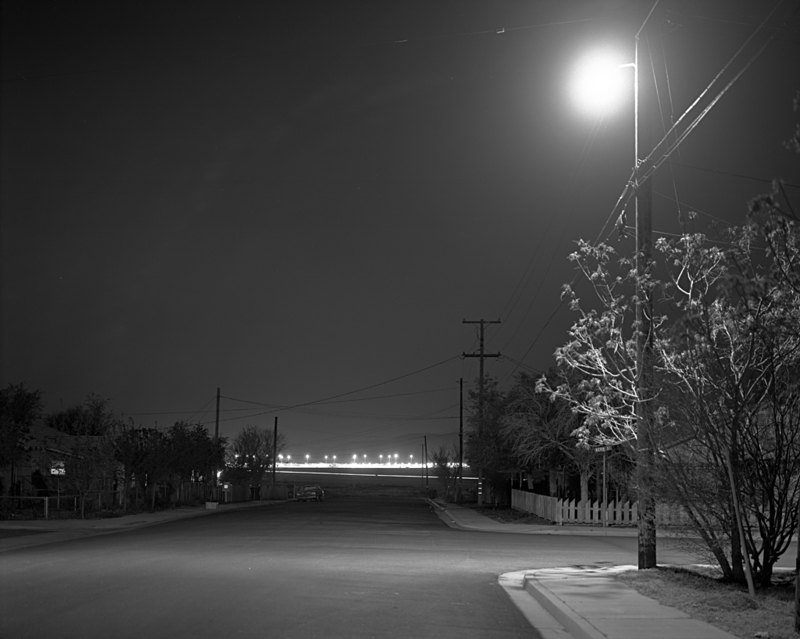 In a town that was in economic decline it was unusual to see these new bright lights illuminating the horizon that had once just been cornfields. There had been talk of building a prison before but the local community was always against it. When the hospital was closed and jobs were lost the prison plan became much more palpable based on people needing jobs. I made one image on a visit home that haunted me for several years. It’s not even a good image but there was an undercurrent that kept pulling me back in. It was through this image that I began to notice other new prisons sprouting up in rural areas and I began to research what was happening. At first, it was simply on a visual level but as I learned more about the prison system in this country I became obsessed. Pete Brook: How do you choose the prisons to photograph? ST: There is lots of planning that goes into it, but I rely on my instinct ultimately. The Internet has been extremely helpful. There are three main paths to follow: 1. State departments of corrections 2. The Federal Bureau of Prisons and 3. Private prisons. Usually I look for the density of institutions from these sources and search for the cheapest plane ticket that would land me near them. Structurally the newer prisons are very similar so it’s the landscape they inhabit that becomes important in differentiating them from each other. Photographing them at night has made illumination important. Usually medium and maximum-security prisons have the most perimeter lighting. JTD: Do you research prisons before you go, and do you choose them for specific reasons? Once you are there, how long does it take you to scope out your location and set up your shot? ST: Lots of traveling, and lot's of research prior to each trip. The unfortunate circumstance of this project is the realization that there is a huge prison industry that has exploded in size over the last 25 years. I had some fantasy that I would have an image from every prison in the country but there are too many to photograph all of them. Once I find a prison to photograph there is a lot of surveying the location to find the right angle. Technology has made it easier, and Google Earth is very helpful in scouting out the prison and it's surroundings. I'm rather methodical and I'm not always welcomed by the authorities, it takes me forever and I always feel bad if someone has accompanied me and has to sit through my decision making process. PB: What percentage of prisons do you seek permission from before setting up your equipment? ST: I usually only do it as a last resort. I've found that the administrative side of navigating the various prison and state officials was too time-consuming and difficult. They like to have lots of information and exact schedules that usually don't sync with the inherent difficulty of making an interesting photograph. I make my life harder by photographing in the middle of the night. The third shift tends to be a little less PR friendly. PB: You have traveled to many states? How many prisons have you photographed in total? ST: I've photographed in 46 states. Quite the trip considering many of the places I photograph are located on dead-end roads. My best guess is I've photographed close to 100 prisons so far. fototazo: Take us out shooting with you; walk us through your process. What happens between arriving and driving away? ST: Well before ever leaving the house I do a lot of research. There tend to be prison clusters and I try to know as much as I can about each one prior to arriving. I try to get to a site before the sun goes down. This helps to scout out interesting angles and potential problems I might confront. Once the lights of the prison overtake the ambient light things change quickly and so it's good to know the lay of the land. Because these are long exposures using an 8x10 view camera I am at the mercy of wind, rain and sometimes-cranky corrections officers. 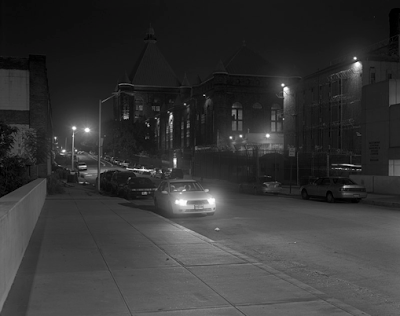 JTD: What specifically is it about photographing prisons at night that you are attracted to? 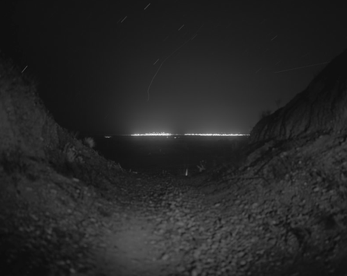 ST: There is a separation that occurs when night falls and a prison becomes an optical presence in the landscape. In the darkness they make a defiant stance against the landscape surrounding it. They radiate light back into the landscape like an artificial sun. During the day the architecture and the perimeters are clearly demarcated; but in the darkness the visual boundaries extend beyond the walls. They become the light source that illuminates the visible landscape. f: I'm curious about the "formal history" of the images. Did you make the photographs at the beginning of the project the same as you do now? Have your strategies changed in terms of distance from the prison, exposure, in where you place the horizon line, in how you frame the prison lights with their surroundings? ST: In the beginning the first ones were in color but I felt like they resonated better in black and white. The color images looked too sci-fi to me. Some of this was technical in nature, but mostly I felt the images worked better stripped down to an elemental level. 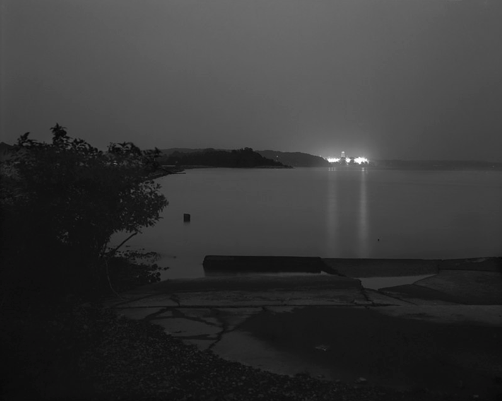 The consistent aspect in all the images is the prison lights so how the landscape is rendered is always the challenge. The early ones were more minimal, now I try to include more elements of the landscape. JTD: Your photographs purely as images are visually rich in tones and light. What is represented by that light, however, is a society removed from larger society for crimes committed. Is this tension between photographic beauty and the social reality something you intentionally employ, and if so, what kind of meaning do you hope it creates in your work? ST: Beauty can subvert and hold our attention even if the subject is quite abject. Goya's "Disasters of War" comes to mind as well as Warhol's electric chair prints. For some these images might help them to consider something that they might normally find easy to ignore by the light of day. I hope the work helps to create a dialogue about why these places exist in such large numbers in the US. JTD: Have you ever been interested in going inside a prison to photograph, or of making portraits of prison inmates? ST: There is large archive of photographers who have worked inside prisons all over this country. For me I felt I didn't have anything new to add. Initially I did go inside to see if I wanted to make work of inmates or the interior architecture of the prison but the location and the world surrounding the prison felt more interesting to me visually. I guess I'm attempting to connect the outside world with these institutions. Looking from a distance at a place that is so highly surveilled becomes an investigation of the psychological as well as the physical boundaries. To me it becomes a form of visual feedback or echo. JTD: Do you think of your work as political? ST: Absolutely, I feel the burgeoning prison system in this country reflects back on the society that builds them. You know we lock up more people than any other country in the world. I think the lack of funding for education, health care, and an unwillingness to invest in our own citizens has resulted in a reactionary policy of prison building to help politicians get re-elected. Our thirst for punishment and prisons has created a profit based private prison industry that you can buy stock in. If you look at the demographics of the U.S. prison population it is predominately male, undereducated, and poor. There are estimates that over 25% of those incarcerated are mentally ill prior to entering the system…When I present the work, I provide background information to prevent there being too much ambiguity as to where I stand. f: Are you political by nature? Or are you a visual person whose work in image making has opened up a project that has made you more political? ST: I don't think of myself as being overtly political, but I do feel it is the artist’s terrain to explore the realm of social commentary. This project started simply as an aesthetic observation of light on the landscape and maybe it turned me into the accidental activist. I guess it proves the power of the image because once I made the first image in my hometown I became engrossed in knowing as much as I could about the prison system. I want these images to be haunting and beautiful. I hope they function as a path to the viewer’s imagination. Maybe my witnessing these places through photography can help with a larger dialogue in some small way. PB: Many of your prints are have the moniker "Death House" in them. Explain this. ST: I find it difficult to comprehend that in a modern civilized society that state sanctioned executions are still used by the criminal justice system. The Death House series became a subset of the overall project as I learned more about the American prison system. There are 38 states that have capital punishment laws on the books. Usually each of these 38 states has one prison where these sentences are carried out. I became interested in the idea that the law of the land differed depending on a set of geographical boundaries. f: What evolutions and changes have you seen in the prison system during the fifteen years since taking the first images connected with this project? What direction is the system going in? Have we made any progress? ST: The debate over capital punishment has led to progress in several states to overturn this statute. On the other hand private for-profit prison corporations have continued to grow due to the increase in the prison population. f: Talk more about the complicated economic relationship between the prison system and their host towns. Have we become locked into our current prison structure because of the economic reliance many communities now have on the corrections industry? If a prison reform movement grows, how should we navigate the issue of towns that have become economically reliant on their prison? ST: This is why I continue to document these sites. Most of these communities have fallen on hard times due to a myriad of reasons and the institution of prisons have become the de facto replacement that won’t disappear overnight like many other industries. f: Should a struggling town avoid looking at hosting a prison for economic relief? ST: That's a complicated question; it's easy for me to say they should avoid building a prison in the community. The economic benefit has limits and there are demands on the towns that go beyond just bringing jobs. That being said most of these communities are desperate for jobs and they will take any lifeline thrown at them. There are lots of company towns throughout the US but in this case the product is human. Many of these communities tend to be rural and see much of the prison population to be made up of urban offenders. A common refrain I’ve heard is "if we don’t take it the next town over will." PB: You have described the Prison as an "Important icon" and as a "General failure of our society." Can you expand on those ideas? ST: Well, the sheer number of prisons built in this country over the last 25 years has put us in a league of our own regarding the number of people incarcerated. We have chosen to lock up people at the expense of providing services to children and schools that might have helped to prevent such a spike in prison population. PB: It seems that America's prison industrial complex is an elephant in the room. Do you agree with this point of view? Are the American public (and, dare I say it, taxpayers) in a state of denial? ST: I don't know if it's denial or fear. It seems that it is easier to build a prison in most states than it is a new elementary school. Horrific crimes garner headlines and seem to monopolize attention away from other types of social services and infrastructure that might help to reduce the size of the criminal justice system. This appetite for punishment as justice often serves a political purpose rather than finding a preventative or rehabilitative response to societies ills. f: Where in the world should we be looking to as a society for a better prison system model and for a model of a more proactive society with stronger humanistic support programs to help reduce incarceration levels? ST: I think the best way is to find better ways to deal with poverty, education, and human rights. The prison system in the US has grown at the expense of funding education, public health, and investing long term in sustainable community initiatives that combat crime. In my view we have an extremely complicated history in the US. Contradictions abound throughout our short history. Along with brilliant success and economic power we have built a prison system that hold 24% of the world prison population even though the US represents only 5% of the worlds population. In a country that holds it's constitutional freedoms so dear we are the best in the world at locking people up. f: Ideally, what effect will your work have on your viewers? Are you hoping to expand our knowledge of the prison system or for viewers to be moved to action? If the ideal is to inspire action, what steps would you like to see viewers moved by the work take towards pushing for change in the relationship between prisons, economics and humanism? ST: I’ve always felt that this group of images could be seen as a type of atlas, one that marks individual, geographic and political boundaries. My hope is that these images stir a healthy debate and initiatives to reduce the use of prisons as a social engineering tool. By redirecting some of these resources into education and job creation for communities at risk the overall demand for incarceration could be reduced. PB: How do you think artistic ventures such as yours compare with political will and legal policy as means to bring the importance of an issue, such as prison expansion, into the public sphere? ST: I think artists have always participated in bringing issues to the surface through their work. It’s a way of bearing witness to something that collectively is difficult to follow. Sometimes an artist’s interpretation touches a different nerve and if lucky the work reverberates longer than the typical news cycle. PB: In your attempt with this work to “connect the outside world with these institutions”, what parameters define that attempt a success? ST: I’m not sure it ever is… I guess that’s part of what drives me to respond to these places. These prisons are meant to be closed systems; so my visual intrigue comes when the landscape is illuminated back by a system (a prison) that was built by the world outside its boundaries. It’s a bit like sonic feedback… maybe it’s the feedback of exile. JTD: Have you ever shown your work to officials within the prison system? If so, what has their reaction been? ST: Yes, sometimes when I need permission I meet with prison officials or wardens. Most have been very positive about the images. Once I showed a warden in Louisiana a photo of a prison in California and he said I could photograph his prison if I made it look as good as the image of the California prison. PB: Have you identified different reactions from different prison authorities, in different states, to your work? ST: The guards tend not to appreciate when I am making the images unannounced. Sometimes I'm on prison property but often I'm on adjacent land that makes for interesting interactions with the people that live around these institutions. I've had my share of difficult moments and it makes sense why. The warden at Angola prison in Louisiana was by far the most hospitable which surprised me since I arrived unannounced. PB: What would you expect the reaction to be to your work in the 'prison-towns' of Northern California, West Texan plains, or Mississippi delta, towns that have come to rely on the prison for their local economy? ST: You know i'’s interesting because a community that is willing to support a prison is not looking for style points, they want jobs. Often I'm struck by how people accept this institution as neighbors. I stumbled upon a private prison while traveling in Mississippi in 2007. I was in Tutweiler and I asked a local if that was the Parchman prison on the horizon. He said no that it was the “Hawaiian” prison. All the inmates had been contracted out of the Hawaiian prison system into this private prison recently built in Mississippi. The town and region are very poor so the private prison is an economic lifeline for jobs. JTD: Your images have received some attention recently, including the Massachusetts Cultural Council grant in 2007 and several exhibitions. What are your plans for this work, and are you working on anything specific right now? ST: I have been very fortunate, without the Guggenheim Foundation grant and the Massachusetts Cultural Council grants much of this would not have happened. Ultimately, I would like to see this as a book; my efforts with this project are shifting in that direction. JTD: Do you see yourself continuing this work indefinitely, or do you feel you will reach a point when the project is finished? ST: I'm in the latter stages of the project now. There are a few more prisons that I need to photograph and then spend more time on my other projects. The scary thing for me is how immense the prison system has become, these pictures really only scratch the surface. PB: You said earlier this year that you are nearly finished with "Of Lengths and Measures." Is this an aesthetic/artistic or a practical decision? ST: I’m not sure if I will really ever be done with it. From a practical side I would like to spend some time getting the entire body of work into a book form. I think by saying that it helps me to think that I am getting near the end. I do have other things I'm interested in, but the prison photographs feel like my best way to contribute to the conversation to change the way we do things. f: How is the process of turning the project into a book going? ST: Slow…mostly my fault. I keep finding new sites to photograph and want to make sure they would be included in the finished book. I like going out and making pictures so the sitting down and editing part is harder for me. It’s coming though.